LENOX — Powerful theater can ensue when an artist simply, or not so simply, decides to bear witness: This is what I saw, this is what I experienced, this is what I think it means, this is why you should care. Stephan Wolfert commits himself body and soul to that mission in “Cry ‘Havoc!’,” and the result is riveting. The subject of Wolfert’s raw and personal solo show, which he is now performing at Shakespeare & Company, is the psychological devastation of war, both on the battlefield and long after the soldier has left that battlefield. It’s a topic he knows firsthand as a former infantry officer and medic in the US Army and a veteran of the first Gulf War who struggled with sleeplessness and excessive drinking for years and one day found himself on the brink of suicide. Being “wired for war’’ meant developing a deep camaraderie with your fellow soldiers, but it has also historically meant, Wolfert makes clear, dehumanizing the enemy in ways that have sometimes led to atrocities, such as the My Lai massacre during the Vietnam War. In a smart touch that immeasurably deepens and enlarges “Cry ‘Havoc!’,” Wolfert enlists Shakespeare as a kind of coauthor. Interspersed among his own personal reminiscences and observations are well-chosen excerpts, passionately delivered by Wolfert, from “Henry V,’’ “Richard III,’’ “Titus Andronicus,’’ “Julius Caesar,’’ and “Coriolanus.’’ Virtually no corner of human experience was beyond the reach of Shakespeare’s imagination, and he was never more penetrating than on the subject of war. So when Wolfert describes or reenacts an episode of battle or trauma from the recent past, and then suddenly unleashes a burst of Shakespeare written more than four centuries ago, the effect is to bathe the episode in a searing, almost blinding light. 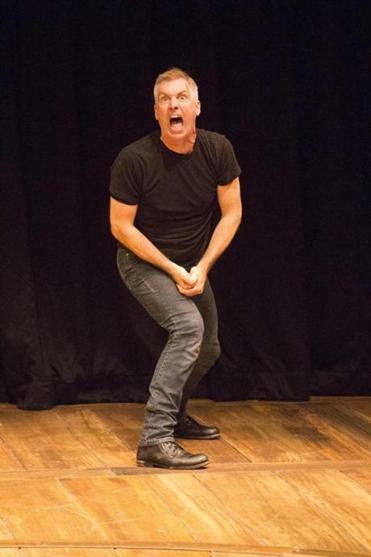 Wolfert delivers a dynamic and physically expressive performance in “Cry ‘Havoc!’,” remaining in constant movement while attired in a dark T-shirt and jeans. Though his subject could scarcely be more grim, Wolfert periodically breaks the fourth wall to banter with the audience, an approach that undeniably builds a certain rapport but risks dissipating the spell he is working so hard to cast. He emphasizes the timeless universality of the soldier’s experience, dwelling at length on the story of an African-American infantryman during World War I named Henry Lincoln Johnson, who overcame nearly impossible odds to save a comrade from the Germans, suffering two dozen wounds in the process. What haunts Wolfert — he choked up at the performance I saw, and in that moment did not appear to be acting — is imagining Johnson’s struggles after the soldier returned home. He notes Johnson died homeless and penniless, drinking himself to death by the age of 33. Wolfert has his own harrowing tales to tell, including an account of holding in his arms a mortally wounded friend who had been struck in the face by a round of ammunition. Almost as wrenching is his story of an episode from only a decade ago that illustrated how much psychological fallout Wolfert was still coping with. Yet while he lays himself bare in “Cry ‘Havoc!’ ” Wolfert also makes demands on the audience. In particular, he forces us to think about our responsibility to and for the countless vets who were “wired for war’’ but are now back home, struggling day-to-day, sometimes behind closed doors but often in plain sight, before the eyes of a society that claims to honor their service.